Many Clubs in the UK have had great success promoting and building their Flying Fifteen fleets upon older boats in the Classic and Silver Fleet categories. They are a great way in to Flying Fifteen Racing at a sensible cost. I cant explain why, but the Classic and Silver phenomenon while satisfactory at Datchet, has never quite taken off with us and it’s not obvious why. However, we do have something else that has taken off in their place – with sensible, competitive ownership costs, and top class Open Fleet performance. The Ovington Mk IX…. Ovington have been building the Flying Fifteen for around 20 years. They have revolutionised the product – it seems very rigid, has an extremely long racing life – and retains its looks. Many of our Club Fleet are Ovington Mk IX and Mk IX “Smoothies”. Most importantly this boat stays top-notch competitive with new boats. It’s where the “smart money” seems to go. It’s a sensational boat and on the flat waters of Datchet goes like a train. It was also of course the dominant racing design for a decade – until the Mk X was introduced. I’ve had both, and quite honestly I think the speed is indistinguishable between the two on Datchet Waters. It’s Where the Smart Money Goes…. “Well, that’s a bit presumptuous”, did I hear you say?? Bear with me…. Of course, to say it is “where the smart money goes” is all very well, so long as you have enough money for it in the first place!! New boats are quite reasonably considered expensive by any sane person. How does the business case for a Mk IX stack up against the likes of RS400, RS500, Laser 4000 and the 505 for example. Well, you don’t know how expensive a boat is, until you sell it. Of course, you have to have the capital to enter ‘the game’, but cost of ownership will include a number of things – and most probably depreciation is the biggest. However, the first thing in assessing say a 5 year racing life is whether you can sell it at the end of it – is there a market? There certainly is a market in Flying Fifteens – for all ages of boats. Check out the boats for sale on the BIFFA website and see what you think…. So – OK, there is a flying fifteen used boat market and you can sell on when you want to…. but what do the numbers look like?? Where is the sweet spot in racing terms?? If you want a bucket of fun winning races in a very competitive boat I reckon if you can afford it you buy a ten year old for around £8,000 and race it for five years and sell it for £5,000. Your depreciation is £600 a year of thereabouts – but these boats win races. At £600 a year, it is glacial depreciation and Club Fees or replacement sails start to become more important in the overall balance of costs. If it’s still a bit expensive, you’ll still be in a Club Race winner if you buy a 12-15 year old and race that for 5 years. The annual depreciation would be around £350-400. 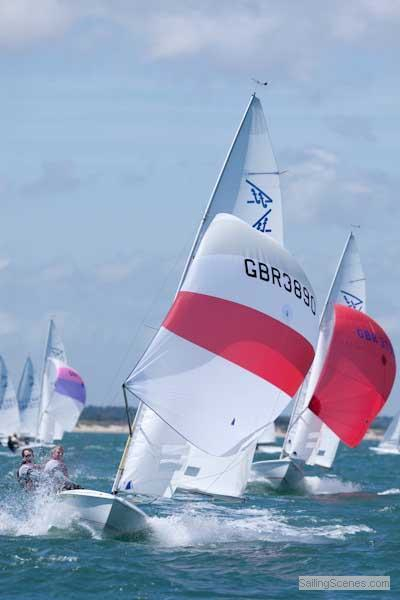 Our 2009 Club Champion boat was a fourteen year old Ovington Mk IX Smoothie – and it’s no slower now…..
Stack this up against owning a new RS/x00, or Laser double hander, and racing it for 5 years, …… what do you think….?? I think too, that you also have to consider the Datchet advantage. We race here all the year round, so there’s around 100 races per annum to try for. So the all important “cost per race” is going to be much better than belonging to a Club which only races 6 or 9 months of the year.